Puri is one of the most famous and favorite dish in India. Be it a birthday party or any other function, Puri has to be, and will be there on the plate. I have also given you an unique Kurma / Koorma ( Dum Gobi gravy ) recipe which blends very well with the Puri. 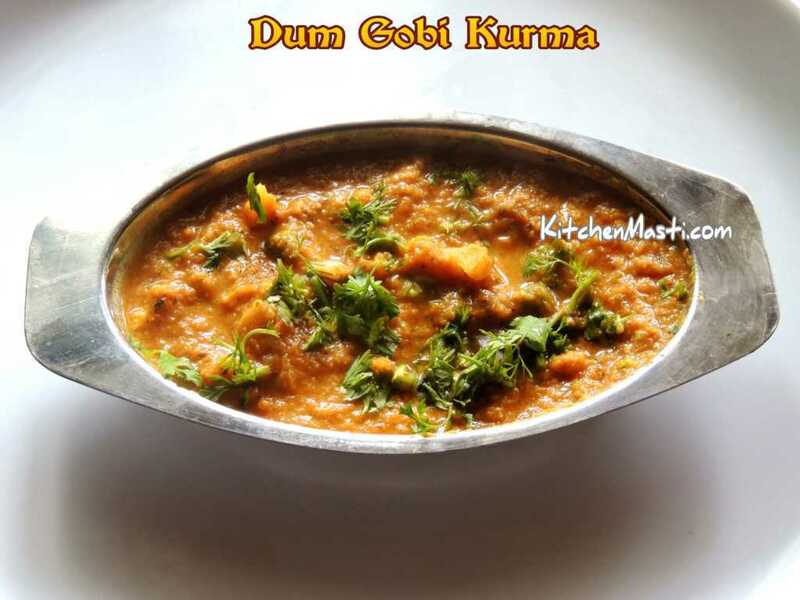 I ve got quite a lot of accolades for this Kurma.So, it would be ideal to prepare this for some special occasions. In one of the restaurants in my native place in udupi, they serve the puri with raw tomato chutney, which is very tasty. The main ingredient in puri is wheat. Food prepared by using wheat flour is a source of strength. This is something that even diabetic people could consume it. 100 grams of wheat has close to 350 calories. Wheat, by the way, contains vitamin E also. Wheat Flour - 3 cups. Boil half a cup of water and add sugar to it. Sugar is mainly added to get the shiny glazed effect. Allow the sugar to dissolve and switch off the gas stove. Now add wheat flour , rice flour , salt and knead it properly . Add more water if necessary since the dough should be a bit harder than Chapathi dough. Knead it properly for around 15 minutes. Roll out small Balls out of it. Add 2 tsp of oil over the balls. Smear it properly. Cover the container with the lid and let it remain aside for an hour. Now, place a deep pan over the fire filled with oil for frying. Press the Balls and roll in to small thin circles and deep fry till the poori puffs up to look like a ball.. Turn it over and fry the other side till it turns golden brown. Remove the puri from the pan and place it over the tissue paper to absorb the extra oil. 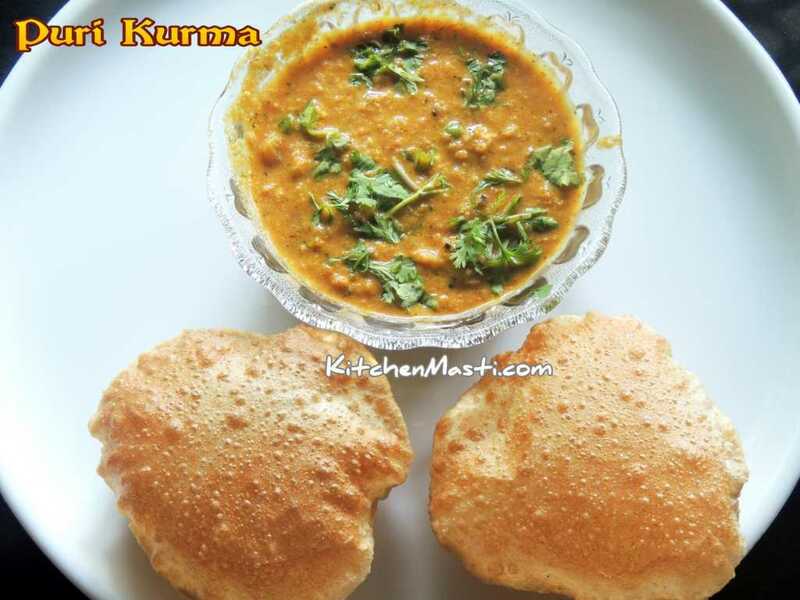 Your Puri or Poori is now ready to be served.!!! KhusKhus ( poppy seeds) - dissolved in water. Boil washed and chopped cauliflower along with water in a cooker for 1 whistle or in a microwave for 5 minutes and let it cool for some time. Place a pan over the stove and add 2 tsp of oil along with 2 chopped onions and fry it till it turns Golden Brown. Add Ginger,Garlic, Khus Khus , Red Chillies, coriander seeds, Jeera, Tomatoes, coriander leaves and fry it for a few seconds. Now add cloves , cinnamon , anni seeds, cardamom. Fry and leave it to cool. Grind the entire Cauliflower except for few florets for garnishing . Place a pan and add 4 table spoons of oil. Add one chopped onion, slit green chillies and fry it. Let it boil for 5 minutes in low flame till the oil oozes out. Finally add 1 tsp of lemon juice. For more crisp puris, we can even add 1 tbsp of bengal gram flour or 1 tbsp of rava ( Semolina ).